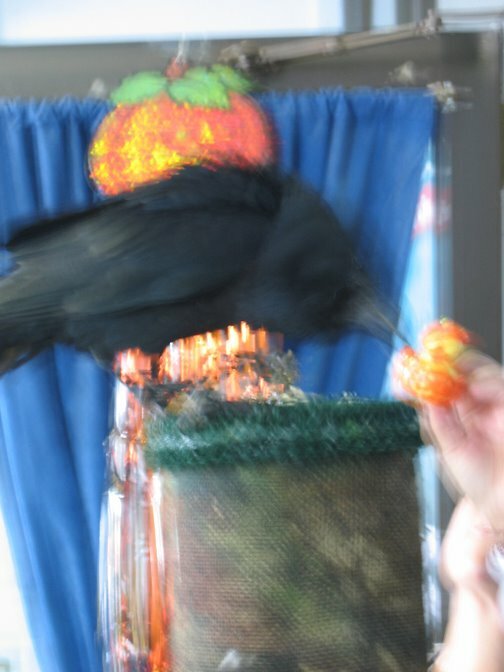 October 31 seems like a good day to mention the American Bird Conservancy's Cats Indoors program, given the traditional link between black cats and Halloween. Some folks express concern about cats' safety while outdoors, especially on Oct. 31, when they might be vulnerable to nefarious pranks. This date and every day are good days for cats to remain indoors--for their safety and the well-being of birds. To learn more and help others become aware of the benefits of keeping kitties inside four walls, please visit the link above. It includes various educational materials that can be downloaded, printed and distributed. 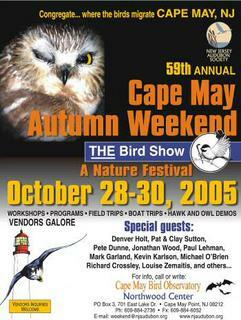 Have you attended The Bird Show during Autumn Weekend? 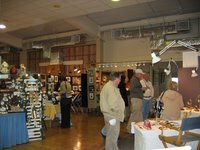 The Cape May Convention Hall fills up with vendors of all types for the three days of the event. With the WildBird booth next to the entrance and exit doors, I get to greet and bid adieu to everyone who visits the show. It's a fun location that lets me talk to many birders... as well as nonbirders who are curious and walked in off the boardwalk. Naturally, many nonbirders come inside because of the signs about The Raptor Project and the live birds of prey show that Jonathan Wood presents every two hours. While standing at the WildBird booth for five to seven hours, I get to chat with the nearby vendors, too. This year, The Bird House of Cape May was on my left (as I stood behind the table) and Tom Ahern Bird Sculpture was on my right. Tom's wife, Barb, also carves bird ornaments, and this year, she brought some Ivory-billed Woodpeckers--which sold out before the end of Saturday. Imagine that! 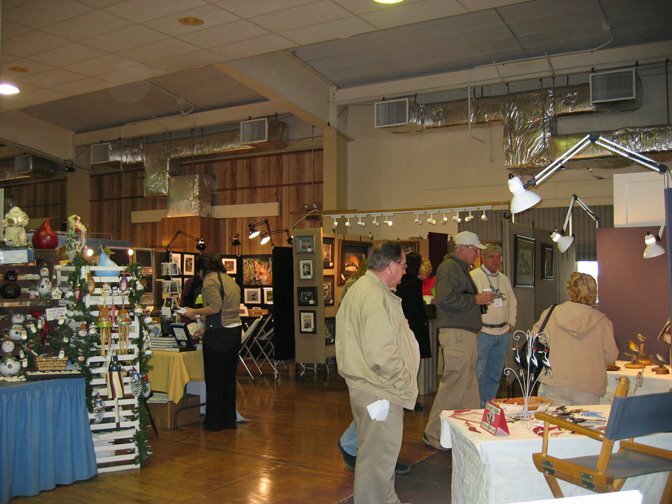 The show closed mid-afternoon, and the convention hall became a flurry of vendors packing up their booths before hitting the road toward home or getting ready for dinner at a local restaurant. I'm already looking forward to next year's Autumn Weekend, and I hope that you'll look for the WildBird booth if you visit The Bird Show. On Friday morning, it wasn't so difficult to spot owls--in the convention hall. As soon as the Festive Faces face painters set up their booth, Sheila Lego and I hopped into chairs. The two talented painters adorned Sheila and me with plumage and beaks in no time. We both enjoyed seeing other folks' reactions and encouraging them to join the "Happy Owl-o-ween" spirit of the weekend. While standing at the WildBird booth, I got to point folks toward the face painters until we closed The Bird Show at 5 p.m. 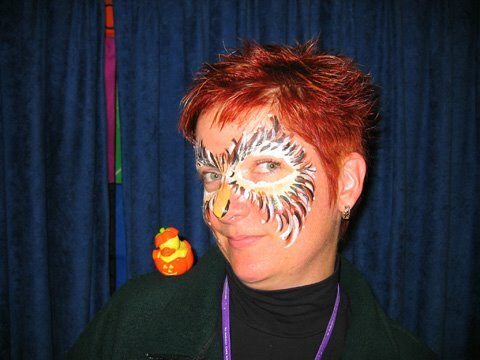 I had so much fun as an owl that the paint remained on during dinner and Denver Holt's program about Snowy Owls. It's a little odd to meet people like Denver while wearing face paint... but it makes an impression! With generous assistance from Clay Taylor, I sat in a hawkblind for the first time. Not only did I get to do so with Clay--who's been trapping and banding hawks for decades--I got to sit in the far north hawkblind with Bill Clark. 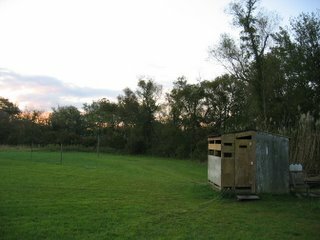 The two generous fellows showed me what's what inside a hawkblind, and then I sat behind them while they worked the lure birds to attract passing Cooper's Hawks and Sharp-shinned Hawks. Renee joined us in the blind, and she later trapped a beautiful male American Kestrel. 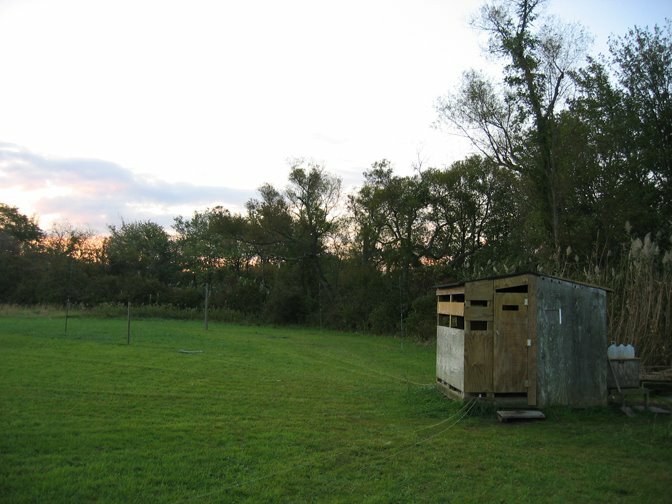 With three birds secure in their protective cans, Bill and I drove to the north hawkblind to retrieve two more birds before driving to Cape May Point State Park for a hawkbanding demonstration. About 20 folks formed a semi-circle around Bill as he and Josh, one of the CMBO interns, held the birds while discussing their natural history and markings. The appreciative crowd got to see up-close the size difference between male and female Sharp-shinned Hawks and between male and female Cooper's Hawks. Bill and Josh released each bird after answering the group's questions. After the demonstration, Bill and I returned to the far north hawkblind, where I got to admire a Red-tailed Hawk before Clay and I departed. We needed to return to the Cape May convention hall to finish setting up our booths. Alas, Ruth the raven did not greet me at the door, as she had on Thursday afternoon's visit to the hall. Ruth is part of the menagerie with Jonathan Wood's The Raptor Project. Here's an arty image of her investigating Jack on Thursday afternoon and helping to create the holiday atmosphere. 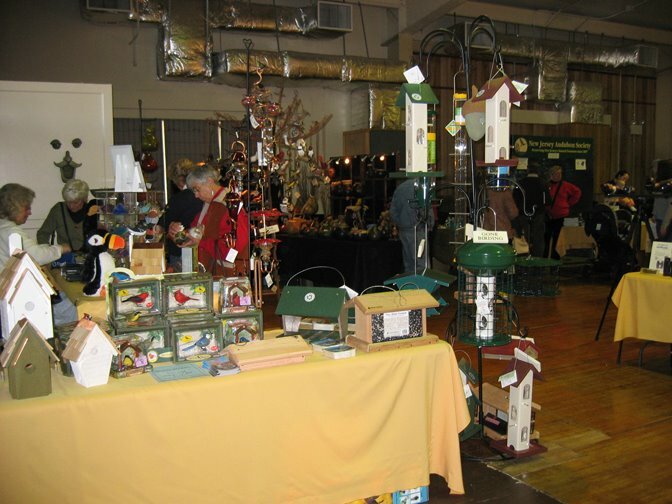 The Bird Show opened its doors for the 59th annual Cape May Autumn Weekend at noon on Friday, and I had a great time greeting visitors and passing out copies of WildBird's annual hummingbird issue. At 5 p.m., the convention hall closed, and many folks migrated to the Grand Hotel for cocktails and the evening's banquet and Clay and Pat Sutton's program: "How to Spot an Owl." Tonight, a red-eye flight will take me from Los Angeles to Philadelphia. 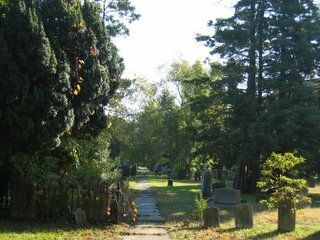 The impetus for this migration: Autumn Weekend in Cape May, N.J. Did you see the New York Times travel article (registration required) that mentioned Cape May? The annual three-day event includes an incredible array of field trips, workshops, demonstrations, walks, presentations and vendors. The schedule includes names like Pete Dunne, John Heuges, Rick Raids, Scott Barnes, Michael O’Brien, Pete Bacinski, Stephen Ingraham, Paul Lehman, Katy Duffy and Patrick Matheny, Clay Taylor, Frank Gallo, Louise Zemaitis, Vince Elia, Don Freiday, Gail Dwyer, Mark Garland and Dan Koeppel. The Friday and Saturday evening program will focus on owls, with presentations by Clay and Pat Sutton and Denver Holt. What a bonanza! 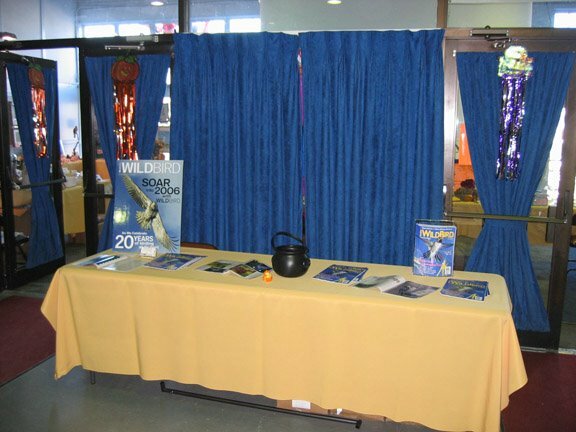 I’m looking forward to visiting some great spots in the early morning, passing out copies of WildBird and signing up birders for the WB raffles in the convention hall, catching up with some fabulous folks... and looking for karaoke spots in Wildwood. Today is ad close for the January/February 2006 issue, and tomorrow is dummy day. After receiving a run list in the early afternoon of dummy day, I will create the editorial map for this issue and give a printout of it to the production coordinator, who will double-check that I didn’t overlook any ads. I also will give a copy to the art director. He’ll also receive electronic roughdrafts of the articles, columns and departments. Before dummy day, I had placed the edited text and the scans of the photos into QuarkXPress documents, added captions and photo credits to accompany the photo scans, and proofread the roughdrafts. I usually don’t receive the first layout until the day after dummy day. While the art director works on the first layout, I will edit the classified advertisements, return the proof to the classified coordinator and tie up loose editorial ends. The production cycle for this issue is a little odd, in that I’ll not be here for two days. There’s always an element or twist during the production cycle that will keep me on my toes! P.S. This morning, the cover commitee approved the design and blurbs for the Jan/Feb cover. With a few tweaks, it's ready to go. Yay! Ever wonder what goes into producing the publication that lands in your mailbox? Here’s a peek into a birding magazine editor’s routine. Tomorrow is a deadline that we call “ad close.” Other publishers might have different labels for the date on which the ad sales representatives must stop selling advertisements that will appear in an issue. On the 25th, I need to have all of the editorial text and photographs ready for the January/February 2006 issue, because Oct. 26 is the beginning of the production cycle. I call the day after ad close “dummy day” - “dummy” being the label for the map of ads and editorial content in the issue. On dummy day, my production coordinator gives me a “run list” that shows all the ads scheduled for the issue. The most important info to me is the ad size, because it determines which pieces (ads) go first into completing this jigsaw puzzle (dummy). When I began working as an editor, it was the Dark Ages. We used paper, pencil, ruler... and lots of eraser. We loathed dummy day, because the process could take a very long time — sometimes 10 hours. With computers, it takes maybe three hours to create the final version of the dummy. I can make a duplicate of the previous issue’s dummy file and move around the ads rather than repeatedly drawing, erasing and scattering red eraser bits all over the desk and my clothes. Today's L.A. Times sports section naturally included ads for computers and electronics. Imagine my pleasant surprise at seeing a penguin family in the computer monitors and TV screens of the full-page ad for a large electronics chain. Similar to the poster for the documentary "March of the Penguins," the image shows two adults leaning down toward a chick. Questions: How did a warm and fuzzy image like that end up in an electronics ad of all places? Is it supposed to evoke "March of the Penguins," which will be released on DVD in late November? Will the image appear in next Sunday's paper? How long will penguins remain in our flighty (no pun intended) culture's consciousness? The overcast sky made for a mellow, slow morning. A light mist darkened the asphalt streets before my dorkwalk. I saw few birds let alone people. Finally, amid the eucalyptus trees along the street that separates Costa Mesa from Newport Beach, I saw two bright spots against the gray sky. Sitting on the telephone wire leading to a house, the Cassin's Kingbirds said nothing but showed off their yellow bellies. Their bellies brightened the morning with a flash of sunshine. Now I'm ready to tackle today's tasks. Driving south this afternoon on PCH (aka Pacific Coast Highway or Hwy. 1), I spied an unusual vertical addition to a lamp post. As the Bimmer approached the light, I could discern the Great Blue Heron perched high above the fresh asphalt and looking west toward the ocean and the gray horizon. Apparently oblivious to the six lanes of cars below it, the heron stood very still and moved its head once, slightly. Perhaps it was tracking a rodent in the ice plant below and on the highway's shoulder. When I worked at that state beach many moons ago, I didn't notice any herons or see many species other than gulls, House Sparrows and House Finches. Not that I want to pick up trash and clean bathrooms again, but I wonder how many species would catch my eye now! The 2005-2006 season will begin in three weeks on Saturday, Nov. 12. Are you ready, with your research kit and its valuable information already on hand? If you enjoy feeding birds during winter and want to participate in “citizen science” – working with professional scientists to monitor species populations – then click on over the Cornell Lab of Ornithology’s PFW page, sign up for the project, pay the participation fee, obtain your FeederWatch I.D. number and wait for the research kit to arrive in the mail. Then observe the birds, record their activity, and send your data with Cornell. With online data entry, it’s quick… and beneficial in the long run. The data allows scientists to determine and track which species and how many individuals of those species visit feeders. Then scientists can compare the data from each FeederWatch season to look at changes in the birds’ distribution and numbers. Join the fun, and become a citizen scientist today! Speaking of Scientific American, did you know that its editors chose All About Birds as one of the World Wide Web’s 25 best sites about science and technology? Two thumbs up for the Cornell Lab of Ornithology, Swarovski Optik and National Science Foundation. While having fun at the Midwest Birding Symposium, I forgot to mention this: A skeleton found in Argentina reveals a dinosaur about the size of a rooster and poses the possibility that birdlike flight developed independently in two far-flung locations. Is this cool or what? 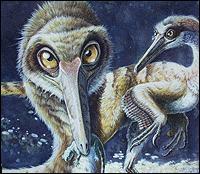 The skeleton shares characteristics of Archaeopteryx, long thought to be the precursor of today’s birds. You’ll find details at Scientific American. This morning's news about Hurricane Wilma becoming a Category 5 storm makes me a wee bit nervous and distracted. According to weather.com: "That should hurl the hurricane toward the Florida Peninsula, probably the southern part of the peninsula, this weekend. Wilma is expected to be weakening by then, but weakening is a relative term and Wilma may still be a major hurricane (winds over 110 mph) when it makes landfall." That means a couple friends, including a birder in Port Charlotte and a National Guardsman in Fort Lauderdale, could receive the brunt of Wilma's wrath. Hence, the distracted state of mind. Wilma's current projected path includes the Orlando area, specifically Titusville, which is on the travel calendar for the Space Coast Birding & Wildlife Festival Nov. 16-20. Will Wilma wreak havoc there? This wait-and-see kind of natural disaster is nerve-wracking! I prefer the spontaneous and quick earthquakes in Southern California. 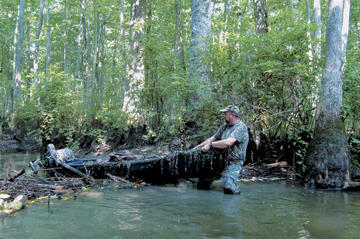 Want to hear from Gene Sparling, the kayaker who first reported an ivory-bill in February 2004 in Arkansas? He and Scott Simon, the director of The Nature Conservancy in Arkansas, will talk about the search for conclusive proof of the species’ existence during the two-hour “Hope Takes Flight” luncheon on Nov. 4. Members of the search team – including Tim Barksdale – offer high praise of Scott Simon. In Tim Gallagher’s book The Grail Bird, he writes, “Scott also has excellent people skills and has managed, single-handedly at times, to keep our fragile coalition together when the inevitable personality clashes take place.” I’d like to meet Scott someday to say “thank you” for his conservation efforts. The blog carnival for birders, I And The Bird, will appear next Thursday, Oct. 27. The deadline for submissions is next Tuesday, the 25th. Visit 10,000 Birds for all the details! During the last two days, my inner child has come out to play during the morning walk around the neighborhood. On Sunday and Monday nights, rain fell, which always means lots of worms on the asphalt streets during my dorkwalk. On mornings like these, the brisk pace abruptly stops while I try to wrangle the worms off the asphalt and into the middle of the nearest lawn. All of the worms pose a challenge; they're typically slippery, you know, and some of them spaz out and make it really difficult to get a good grip. I wonder what a bird thinks when a worm pulls that defensive maneuver. Some worms are thin and short, some are thick and long, and one was really thin and long and sticky. It didn't come off my fingers during the first fling toward the grass. Why do I do this? Because I'm still 6 years old in some respects. I like getting goo and dirt on my fingers. I like touching a bit of nature. I also like the idea of preventing the worm from drying out on the asphalt... and keeping it alive a little longer so that a bird might eat it later! 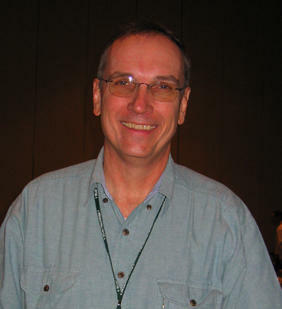 During his speech at the Midwest Birding Symposium, Al Batt of Hartland, Minn., shared many funny anecdotes from his childhood and current life. He spoke of sitting on the front steps of his parents' farmhouse with his siblings and saying what they wanted to do when they got older. Al's sister said she wanted to make the world a better place, and his mom said she could accomplish that by doing good. Al contends that one way to do good is to take a kid birding. "It doesn't matter if they want to go. Drag 'em out there," he jokingly said. Al cited Dr. Seuss as one source of encouragement: "Oh, the places you'll go and the things you'll see!" It's always a good time of year to take a kid birding, but consider making a special effort next year during National Park Week, April 22-30. The theme is "Connecting our Children to America's National Parks." Do you live near a national park? If you don't know where the closest one is, look for one here. And please consider purchasing a one-year National Parks Pass, a $50 investment in habitat that hosts birds and other wildlife. When Al said to take a kid out to see birds, a grin appeared on my face. It reminded me of how Al became WildBird's 2001 Birder of the Year. He'd written about leading a nature walk for some junior-high school students and introducing them to the wonder of birds by looking through a spotting scope. 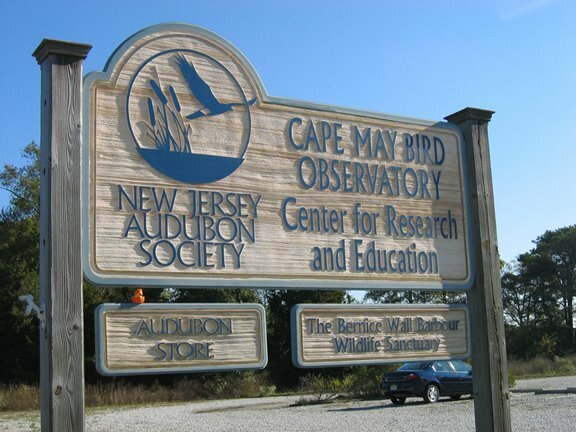 WildBird's readers voted for Al to receive the five-day, four-night Birder of the Year trip to Cape May, N.J. I had the pleasure of taking that trip with Al and his wife, Gail, and I laughed often and loudly. Getting to see Al at the symposium was a treat. Have you voted for the 2005 Birder of the Year? The ballot appears in the November/December issue on page 39, and the deadline is Dec. 1. You can be eligible for Birder of the Year by responding to the questions posed in The Lister's Forum and Birder's Back Yard departments in every issue. If you put your hand to paper, you might win optics and a trip to a birding hotspot! This year's symposium offered an incredible number of great speakers with fabulous information. In addition to Don and Lillian Stokes, John Acorn and Bobby Ray Harrison, the schedule included Alicia Craig of American Bird Conservancy; Don Kroodsma, author of The Singing Life of Birds; and birdsong recordist John Feith among many others. Can the Davenport organizers top that variety during the next event on Sept. 13-16, 2007? Mark your calendar now, and keep your eyes on the Quad Cities Convention & Visitors Bureau website for details about the speakers. At the 2007 event, I look forward to learning from the presenters... and enjoying more portobello fries on Centro's patio, next to the colorfully lit Skywalk. Neil Rettig visited the Birder's Marketplace in the RiverCenter today with his 10-pound Harpy Eagle, Cal. What an incredible creature! Neil described his work in Guyana's rain forests to observe and film this raptor, which doesn't soar but travels from tree to tree while hunting. He said it hunts like a shark and feeds on monkeys, sloths, anteaters and deer. 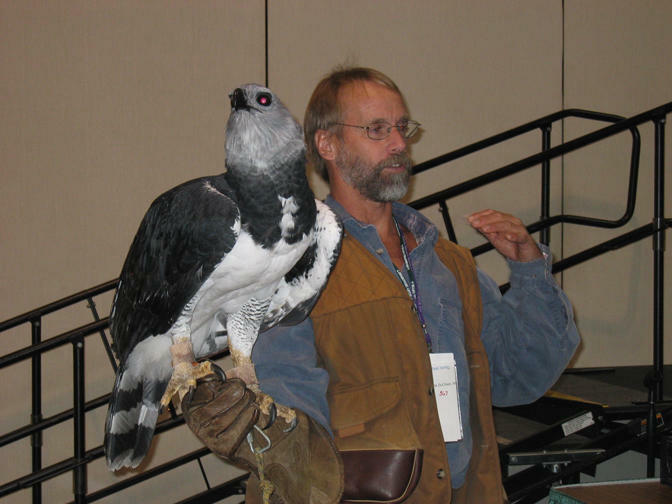 A Harpy Eagle can fly 50 to 60 miles per hour with its long tail acting like a rudder for sharp turns amid the trees. Its facial disk filters sound, just like the feathers on an owl's head. While Neil talked and answered questions from the audience, Cal's head rarely stopped moving. His head bobbed up and down and weaved from left to right almost the entire time, and he occasionally chirped. Cal probably will live to be 50 years old, while wild Harpies live maybe 30 years. 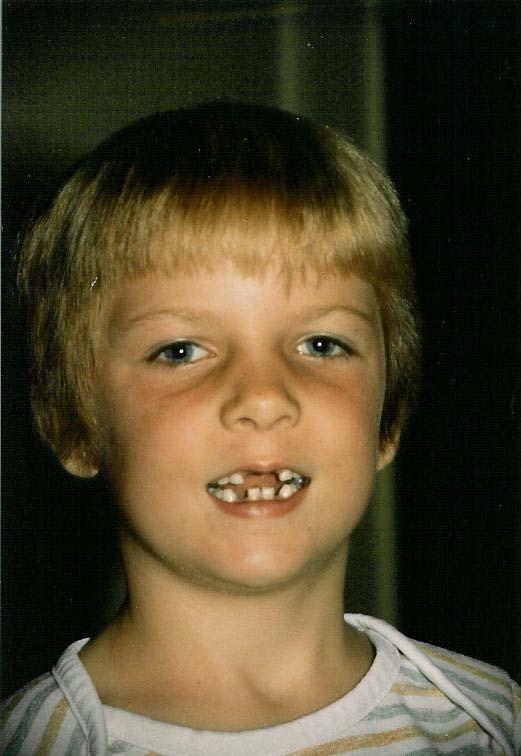 Cal was raised by The Peregrine Fund in Boise, Idaho, before living with Neil. The morning field trip to Andalusia Slough began with a quick bus ride to Sunset Park & Marina. 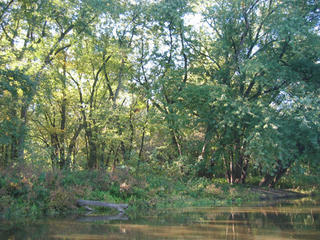 The crisp air felt good as we boarded the johnboats and began motoring toward the Mississippi River. Our boat included three birders and Joe, a U.S. Army Corp of Engineers forester. He talked about the Corps’ work with the river and other highlights of the area and its history. The beautiful weather provided a wonderful backdrop for a pleasant excursion. It included two deer swimming across a side channel, Turkey Vultures sunning on a powerline tower with their wings outstretched, and various species singing or calling: White-throated Sparrow, Carolina Wren and White-breasted Nuthatch. Tammy, a birder in my boat, spotted an adult Bald Eagle over the river. It looked magnificent and was the highlight of my morning. What an awesome bird! After an afternoon of chatting with vendors in the Birder’s Marketplace at the RiverCenter, I boarded a bus to the Celebration Riverbelle riverboat for the dinner cruise. The delightful evening included an almost-full moon shining on the Mississippi, a pleasant view from the top deck, high-spirited conversation and fun musical entertainment. Bobby Ray Harrison is a funny man. This afternoon’s talk about his research and rediscovery of the species with Tim Gallagher, titled “Obsessed with the Ivory-billed Woodpecker,” included interesting details about the elusive species’ history and behavior. It also included anecdotes and revealing comments about himself and Tim, who works as editor of Living Bird at Cornell Laboratory of Ornithology (after working on WildBird as associate editor when WB began in 1987). Among the more interesting aspects of Bobby’s talk were the illustration of the bird’s recurved tail, thought to serve as a spring when it hammers wood in search of beetle larva, and a picture of an ivorybill skeleton at the American Museum of Natural History. Bobby said the bird was so close to their canoe that “I could see light shining off veins in the primary feathers.” Can you imagine?! Today's migration from Orange County, Calif., to Davenport, Iowa, included a stop in Detroit... and a Sora sighting! Yes, in terminal A of Detroit-Wayne County International Airport, you'll find Sora, a Japanese restaurant and sushi bar. Have you found birds in unexpected locations? One of my favorite aspects of birding is the chance to visit different places and see new birds. This week, I'll visit the Quad Cities area of Iowa and Illinois for the Midwest Birding Symposium. The event takes place every other year, and this year's line-up of speakers and field trips looks good. I'm looking forward to John Acorn's talk at Thursday's dinner, the riverboat cruise on Friday, lunch on Saturday with Al Batt (a previous WildBird Birder of the Year winner! ), and Don and Lillian Stokes' presentation on Saturday. 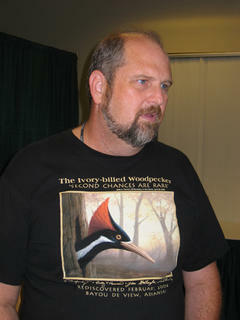 Certainly many birders will want to hear Bobby Ray Harrison's speeches about the Ivory-billed Woodpecker on Thursday and Friday. Bobby provides regular updates about the ongoing search in Arkansas for each issue of WildBird, and readers enjoy those dispatches. No doubt it will be even more fun to hear Bobby tell stories about the Lord God Bird.